If you have a rain sensor connected to your Rachio controller, you will begin to see notifications in your History feed when the rain sensor is triggered on and off by rainfall. These notifications will either state "Rain sensor activated" or "Rain sensor deactivated" and can be found on the "History" tab on the app. What do these notifications mean? When your yard has received enough rain to trigger your rain sensor, you will see a "Rain sensor activated" notification in your History feed. 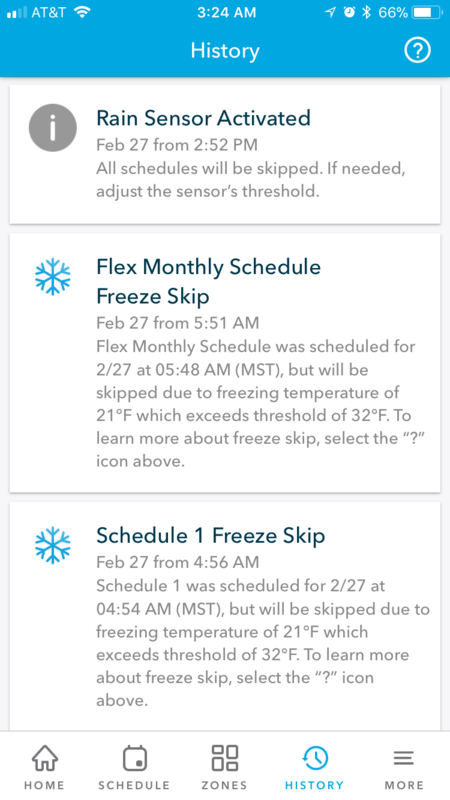 This indicates that the rain sensor has been triggered and subsequently will override the Rachio system, preventing any pre-scheduled watering. Once your rain sensor has dried up, you will see a "Rain sensor deactivated" notification. This means that the rain sensor is no longer triggered and the system will return to normal operation. Is this true of the 3rd generation of controllers? If so what rain sensors are compatable with the 3rd gen Rachio? How do I install a wired sensor or wired flow meter with Rachio 3?